For my research I have developed my own automated animal tracking system called AnimTrack. AnimTrack is fully written in Python 2.7 and is based on the Opencv library. It includes a number of helper functions, including camera calibration and a manual user observer option. AnimTrack enables the tracking of both individual animals as well as groups of tagged animals in a range of environments and provides highly detailed spatio-temporal output of their movements as well as behavioural characteristics. I showcase a number of its capabilities and describe some of the helper functions below. Currently AnimTrack is not available to the public. This is the classic assay for measuring ‘sociability’ in fish. My software AnimTrack automatically determines the average distance from the partition separating the conspecific shoal, the maximum distance from the partition, as well as other detailed movement characteristics such as its speed, heading and orientation. 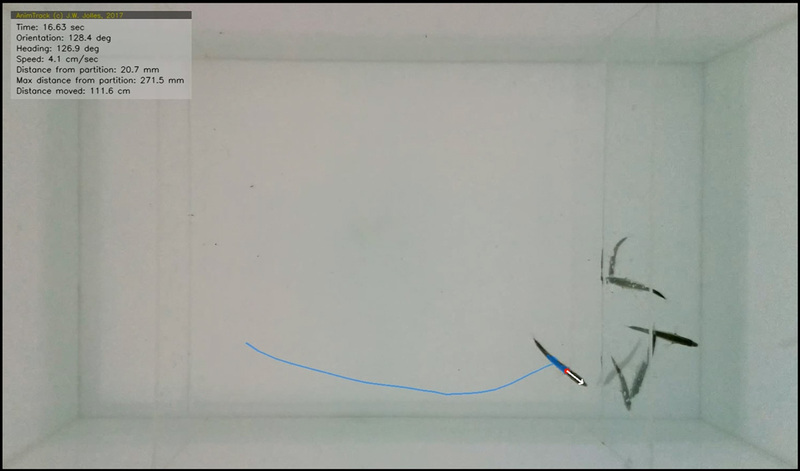 Based on these measures it automatically calculates an individual behavioural score as a measure of the social proximity tendency of the fish. In recent work we have shown that this social proximity tendency is strongly linked to speed and that consistent differences in social proximity may arise due to only differences in movement speed between individuals. Watch a video of the tracking in action here: https://youtu.be/Prh57iw16m4. 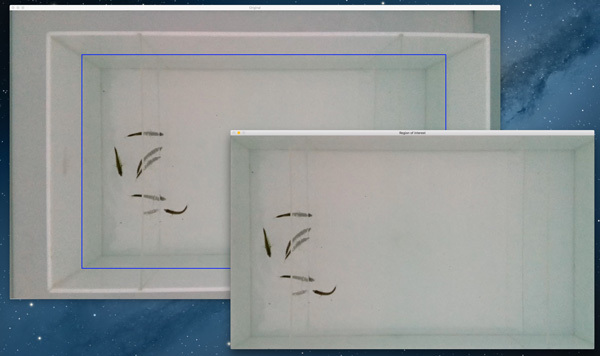 Besides assays containing a refuge or partitions, I also track the movements of individuals in an open environment to determine their natural movement and turning speed, their pattern of movement, and their wall-following tendency. This helper function enables the user to select a region of interest by using the mouse in a saved video, an incoming video stream, or on an image, which is subsequently stored for automated integration in AnimTrack. This function also enables the automatic calculation of a conversion factor to get behavioural characteristics in mm automatically from the video pixel values. This page is not yet completed and will be updated soon..